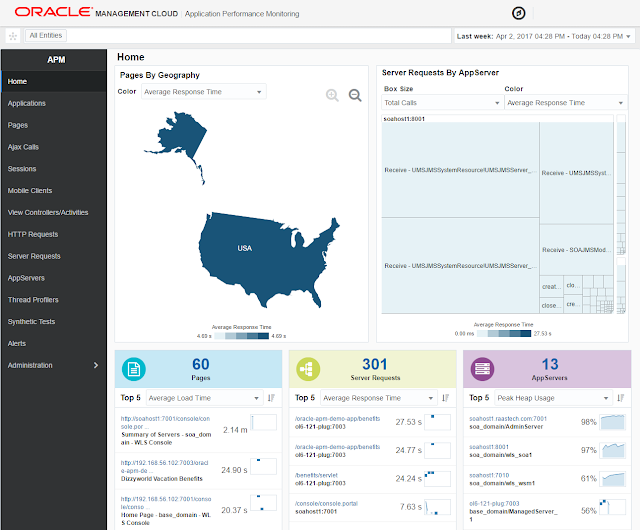 The interface to Oracle APM Cloud Service provides access to an incredible array of features and capabilities, giving you deep insight into performance of your applications. It also includes insight into actual end-user experience, AJAX performance, log analytics, and more. The Oracle APM Cloud Service dashboard provides what you would expect from it... a consolidated and aggregated view of your entire APM landscape. From here, you can get an executive level birds eye view of your environment. You can group together a set of pages or server requests into a single "application" that match a particular filter criteria. Over time, it is not unusual to expect tens of thousands of individual pages and server requests to be monitored, making the need to group them that much more necessary. Pages are exactly that. End-users access various pages of your web application, and each page is individually tracked and monitored, with full drill-down capability. You can monitor end-user experience through "sessions". The first screen here shows you a list of all user sessions within the timeframe you selected. 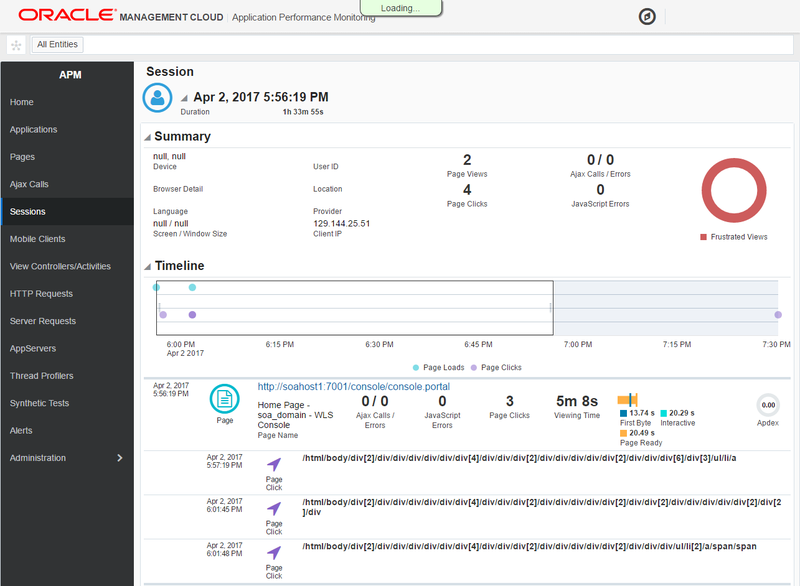 Clicking on a session takes you the exact history of that session, with full performance metrics on each page the user has navigated to. All application servers are listed here, with high-level aggregated metrics shown for the selected timeframe. 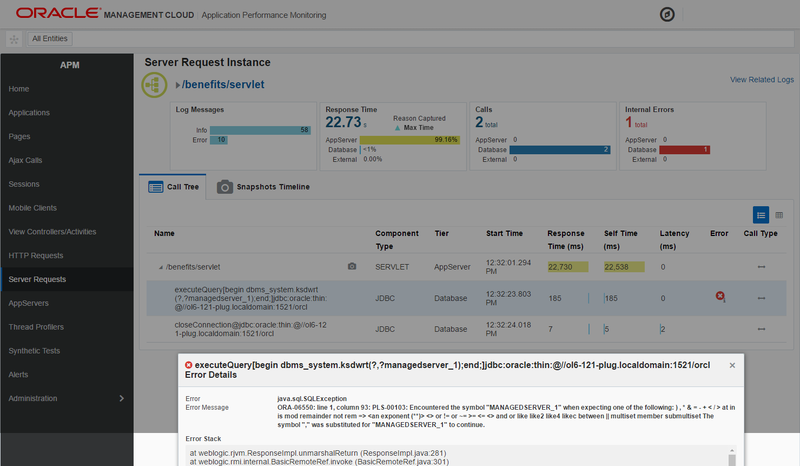 Clicking on any application server takes you to more detailed metrics specific to that server. From here, you can further dig deeper into the server requests tied to this app server, or even kick off the thread profiler to capture more detailed information. 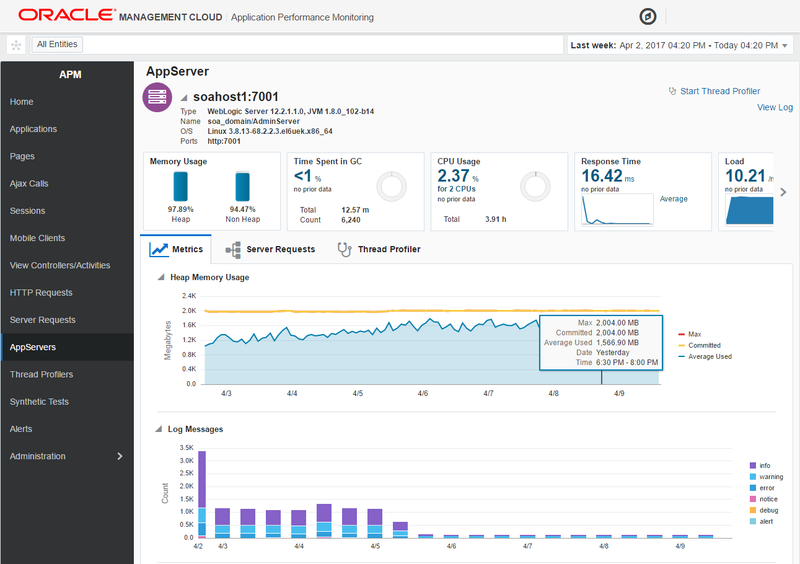 From here, you can assess server-side performance down to the operation and method level. The APM agent is intelligent enough to identify the downstream links to this particular server request, as well as all callers to the request. Detailed metrics are captured, including actual exceptions of each request. 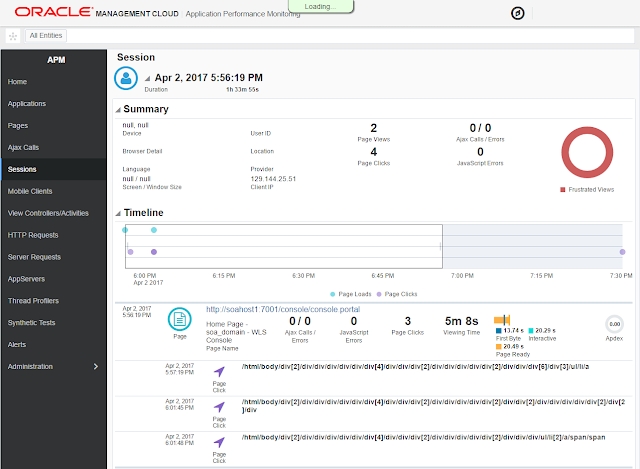 This post is intended to give you a glimpse into the Oracle APM Cloud Service. There is a host of many other features not described here, and more information can be found in the documentation.